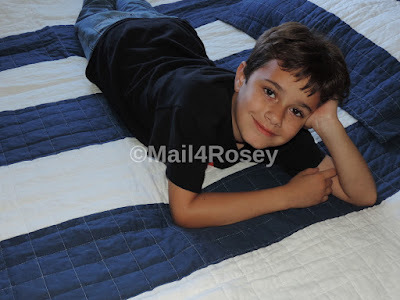 Mail4Rosey: Blankets, Quilts, Throws and More! $100 Lush Decor Giveaway! Blankets, Quilts, Throws and More! $100 Lush Decor Giveaway! What's my son got there? He's got a new quilt for his bed from Lush Decor. What is awesome about that, besides everything is that one lucky reader is going to get a chance to shop at Lush Decor too, because at the end of this post, there will be a $100 gift code giveaway! Lush Decor offers any and everything you might need to dress your bed. Items like blankets, quilts, throws and more are available, and believe me when I say, there are so many fantastic items for sale, that if you're shopping, the hardest part of it is going to be to decide when to stop spending. We live down here in Florida, so it doesn't really get cold, but it is chilly enough at night here right now to need a lighter weight of blanket. At Lush Decor we found a ton of selections we really liked, but it was this Stripe 3-piece Quilt Set available in 4 different color choices that caught my son's eye (this is for a full-sized bed, it also comes in King). Selecting Navy was easy because that's my son's favorite color. There is a Discount Code!! Browse around Lush Decor and you'll be amazed at how many wonderful items they have for sale. If you find something you like and you decide to buy it, type in the Code: ROSEYBLOG and you'll receive 25% off of orders of $80 or more, plus everyone gets free shipping on orders of $50 or more, with the same code. Offer good until the end of this year. One lucky winner also gets a $100 gift code to call their own. US entrants only. You can learn more about Lush Decor by visiting their website. You can also follow them on Facebook, Twitter, Instagram and/or Pinterest. lmao has to smell and touch? Geez, he sure wants to take it all in. Toasty warm is the way to be though. I just love the Serena Comforter 3 Piece Set. I love the Sherpa throws. They look so soft and would make great gifts for the holidays! Oh wow, these are beautiful. I'm thinking about redoing our master. It needs a facelift. I loveee the decorative pillows, the "Baby It's Cold Outside Decorative Pillow" is adorable! That is a great giveaway! I love those decorative pillows. Nothing makes a room more cozy that lots and LOTS of pillows. I like the Lucia Comforter set. Thanks for the great giveaway! I could use a new quilt for our guest bedroom. I like the Aster Throw. Lots of great items to choose from. Alligator Quilt 4 Piece Set is really great. I really like it. I would gift to my nephew. I liked the Maya Set - pretty! That is a great giveaway. That blanket looks great. I love their quilts! They have such unique, brightly colored quilts. The Briley is a favorite of mine, with it's teal colors. I love my Lush Decor blankets! I love that quilt set. The blue and white stripes are such a classic color combo. I like the Navajo 3 piece quilt, Floral Watercolor Comforter 7 Piece Set and the Edward Trellis Furniture Protector. My oldest daughter is in need of new bedding. I think she would love the Cupcake Ice Cream Quilt 3 Piece Bedding Set! I like the alligater quilt set and the Abagail quilt set in yellow. I love that quilt! I think I need to redecorate. Those look so snuggly and warm, and cute too! It's getting chilly here in SC and I could use a new set like this. And I love the $$ give away :) . I like the Cupcake Ice Cream Quilt 3 Piece Set. I love the Cupcake Ice Cream Quilt 3 Piece Set. Thank you for the wonderful giveaway! I learned there is free shipping for orders over $50. Graham Fur Throw looks so warm. I like the Charisma 8 piece Comforter Set. that quilt set is just so sweet! it looks so lush and comfy- definitely need to invest in one of these for my son's bedroom! I love the Charisma 8 piece Comforter Set! I like the Abigail window curtains. We have three dogs and three cats, so I typically use furniture covers on our couches. Most are very boring - single color or reversible to second color. I just love the bright and unique designs they have for their furniture throws. I like the Avon 3 piece set. I would love some Catalina pillows. Look really soft. The color theme of that set is amazing! Nautical looking! oooh, I am living the muted tones of the Elephant Stripe Quilt Set! I wasn't familiar with Lush Decor till this post, but after looking on their site I'm hooked. I really love the Elephant Stripe Shower Curtain and the furry decorative pillows. My son is begging for new sheets on his bed. The ones he has now he says you're too scratchy. I will have to check into days I love the comforter that you have. I like their Boho Stripe 3 piece Quilt. That would look so pretty in our bedroom! I learned that you can save 25% off orders of $100 or more with code. I love the Boho Stripe quilt set in blue, like really love it. I liked the Anchor & Stripe Decorative Pillow. Thanks for the giveaway! That blanket looks so comfy, soft, and warm! I just want to be wrapped up in one right now. I adore the faux wolf fur throw! I also love the baby its cold outside decorative pillow! Belle Quilt Blush 2 Piece Set is so pretty love the color and the ruffles on it so cute. I could use some new pillows! The Sohpie or Danor would work well in my living room. I LEARNED THAT YOU CAN GET $10 OFF ANY PURCHASE OF $50 OR MORE WHEN YOU JOIN THEIR MAILING LIST. I love all of the colors and patterns on this site. I browsed through a couple of pages but still liked the first image I saw the best. The bed spread has a lot of red and green but doesn't really look Cyristmasy. Perfect timing for this post. Our son's room is getting a makeover as we transition to a big boy room! I like that they have free shipping on orders over $50 and that they have discount coupons that stack with that - like their 25% off all purchases for thanksgiving sale! Awesome! Awesome giveaway! The quilt looks like it will keep your son warm and cozy on chilly nights. Thanks for sharing the coupon code! I need a new shower curtain. Think the Leah might be a nice change from what I have now. I love several of the pillows. I really love the Henna Stripe set. My daughter has the Kenya and it is great quality. If you join their mailing list you'll get $10 off a purchase of $50 or more. That blanket sure looks comfy! I love that it's soft enough for the kids to love it! They have some beautiful lush decor. I love all the throws...so many lovely designs and fabrics. Thanks. I really like the Aubree 3 piece quilt set! They have so many beautiful quilt sets. I like buying blankets and quilts that the kids will love. This looks perfect and I'll be sure to check it out! I really love the Boho Stripe 5 piece Quilt. I love the variety of styles and colors. The Blanket your son chose looks so comfy. I like the alligator bed set. I love a great throw! This looks really comfy to cuddle with! I like the Grace Patchwork Quilt Red 3 Piece Set! Ooooo now thIs looks like one comfy comforter!!!! My daughter needs to get a new one sometime soon!!! I love the Room Darkening Block Window Curtains Set in black/white. The Sherpa Throws are really nice. I love how throws make a room look extra cozy and warm. I like the Hotel Collection Shower Curtain White/Gray. Thanks. I like the Misha 3 piece quilt set. I went to their site and I like this item Canvas Shoes Quilt 2 Piece Set. I am crazy about the Carlotta Comforter 5 Piece Set! Cupcake Ice Cream Quilt 4 Piece Set. I like the Serena Comforter 3 Piece Set. I like the Carlotta Comforter 5 Piece Set. I love the Abner Geo Throw Sherpa! Would love to re-do by Bedroom. I like the Kemmy 3 Piece Quilt Set for a King Size Bed. I really like the Jaipur Ikat Shower Curtain! I love all the pillows and the Bettina Throw in the Sherpa print. Love the sherpa blankets!! So warm and cozy! I like the Lavish Damask 6 piece set. Lush Decor is one of the few places to have alligator items, love the Alligator Throw Sherpa. My daughter would love the Elephant Parade Throw Sherpa! She loves elephants. Cute stuff lol. I like the Elephant Parade Throw Sherpa throw for my daughter who loves elephants. I like the Boho Stripe 7 Piece Comforter Set in king. I learned I love that store. I love their decorative pillows, but I really need a new blanket. I liked several of the youth themed quilts, but also found a couple that I like for adults, especially the Botanical Garden and Galicia styles. I like their Jigsaw Chevron Throw Sherpa. I like the Stella Shower Curtain. I love the Paris France Throw Flannel!! I learned they have free shipping on orders over 50 dollars. I really liked the Geometrica Shower Curtain! I like the Lavish Damask Comforter 6 Piece Set. I had never heard of Lush Decor before but they have a lot of nice stuff! I like the decorative pillows. I like so many of their products but I especially like the Aubree 3 piece Quilt. I like the mari comforter 6 piece set. it would look great in our bedroom. I really like the Pixie Fox Quilt 3 Piece Set. It's so cute! This is one of my favorites. So many beautiful options. There are a lot of cute quilts and throws. I especially like the Pixie Fox throw flannel. Love the Mia Shower Curtain. I did enjoy their items. They had beautiful designs, great selection. They have the cutest quilted blankets.. Its a great place to Christmas shop for your family. I love the Royal Empire 3 piece quilt set. I love the blues. I am loving the Serena Comforter 3 Piece Set. Absolutely stunning! I like the Reindeer Head Decorative Pillow. I learned you can get $10 off $50 for joint their mailing list! I love the luca throw fur( blanket) !!! I like the Sophie Throw, looks warm and comfortable. I like the Holiday Checker Decorative Pillow the most as it looks good in all the winter months because the material looks more like a Scottish pattern to me. I liked the Bohemian Stripe Shower Curtain! I like the Brea Window Curtains! We just moved into a new place and could use some sheers! 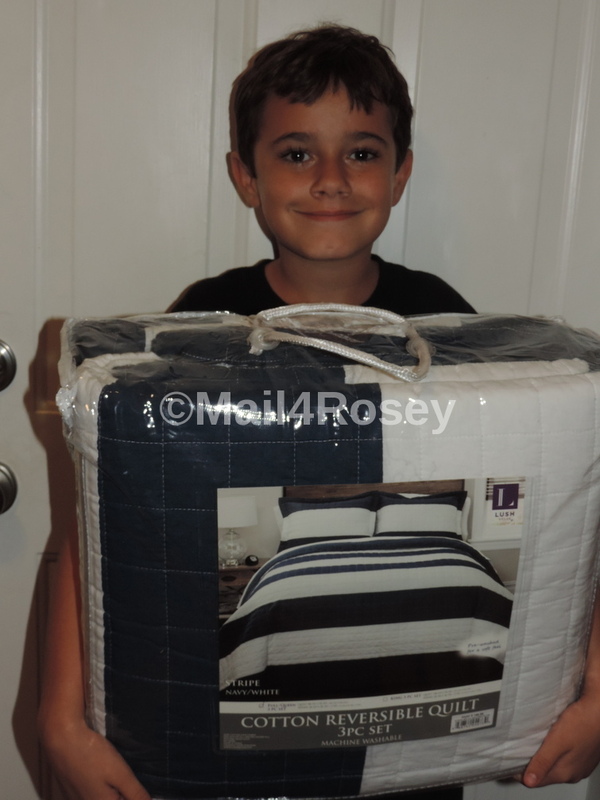 I like the Stripe 3 Piece Quilt Set. I love the Sea Life 3 piece Quilt set. I absolutely love the Serena 3 piece Comforter Set. I love their quilts! Thanks for the chance to win such an amazing giveaway. I love the Kemmy Quilt 3 Piece Set. We like the Sydney 3 piece Quilt set ! I like the Sylvia throw! I don't think you can ever have TOO many blankets.